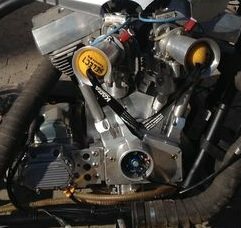 its been raced in Pro Twin class in europe and has been run around 5.6 in 1/8 in its current chassis..
Hes saying its a zippers engine. Strong, and Desireable for Longevity..
As far as i Can see this looks like a delkron case. I might Go check it out.